Taipei is a city of contrast. While its culture is steeped in storied tradition, it is also one of the most modern cities in the world with a heavy focus on technology. Some of the best food can be found in the most modest of eateries at the most affordable of prices. Visitors to Taipei can expect new adventures around every street corner. Not including New Taipei City and other surrounding suburbs, Taipei itself is a very sizable city. However, it is generally easy to navigate once you get used to its layout and systems. Taipei is divided into several different districts and many of the major roads, like Zhongxiao East Road, are divided into sections. There are also lanes and alleys connected to these roads, each with their own sets of unit numbers. As a result, while the addresses can look confusing, they're actually very logical. For example, the address to Bai Guo Yuan, a popular dessert shop, is No.2, Alley 7, Lane 100, Section 1, DunHua South Road, Songshan District, Taipei, Taiwan. Also known as the MRT (mass rapid transit) system, the Taipei Metro consists of 103 stations across 11 intersecting lines. It covers the vast majority of the city. While the individual lines do have names, they are also color-coded for easy reference. The EasyCard tap-to-pay system is highly recommended. The card can be acquired at nearly any MRT station for a deposit of NT$100 (about $3-4 U.S.) and the fare is based on distance traveled. The EasyCard can also be used for payment at convenience stores and other participating businesses. Taking a cab in Taipei is a relatively inexpensive affair. Short rides are only a few dollars and can be more convenient than the MRT when traveling with multiple people. However, the majority of cab drivers speak little or no English, so having the address written in Chinese can be very helpful. Visitors interested in just about anything will find something to enjoy in Taipei. Some of the more popular highlights include the following. No trip to Taipei would be complete without visiting Taipei 101, which was the tallest building in the world until the Burj Khalfifa was built in Dubai in 2010. Much of the tower is office space, but visitors can purchase a pass up to the observation deck and learn about some of the engineering that went into the construction of the Taipei 101. Adult admission is NT$500. There is also a great shopping mall and food court, as well as a number of restaurants. During the Cultural Revolution, many residents of China fled the country and moved to Taiwan, taking a large number of cultural relics for them. These relics were protected and are now on display in the massive National Palace Museum. Visitors can easily expect to spend a whole day exploring the various treasures on display. A regular admission ticket is NT$250. Located in the southeast corner of the city at the end of the Wenhu MRT line, the Taipei Zoo features both local and exotic animals like penguins, elephants and giant pandas. The adult entrance fee is a mere NT$60, making this one of the best values in town. Adjacent to the zoo is the Maokong Gondola, which whisks passengers up through lush greenery to an area famed for its tea growing and tea culture. A full round trip ride costs NT$100. 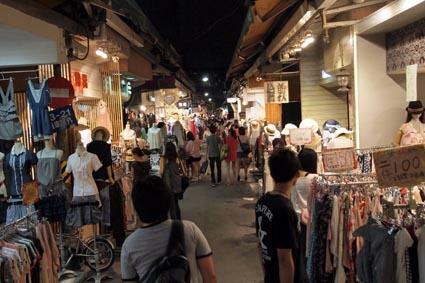 Taipei is a great place to go shopping for local delicacies, cute clothing and unique accessories. The largest night market in Taipei, Shilin consists of several intersecting thoroughfares lined with shops selling clothing, handbags, mobile accessories, and much more. It's also a great place to eat, with many stalls offering a variety of foods. An underground dining area has even more food options. More than a massive transportation hub, Taipei Main Station also has several underground shopping malls connected to it, reaching out in multiple directions. Cheap and unique items can be found throughout, as well as in the area immediately south of the station. Technology enthusiasts will want to take the MRT to Zhongxiao Xinsheng station and walk a few blocks north to the Guanghua Computer Market and Guanghua Digital Plaza. The Guanghua Computer Market consists of both street-level, above-ground and below-ground shops selling the latest electronics from Asus, Gigabyte, Acer and others, including many laptop models you may not be able to buy online in North America. The multi-level Guanghua Digital Plaza is a great place to find the most obscure of computer or electronic accessories. Hotels take on many forms in Taipei and range considerably in creature comforts, amenities and pricing. Located near the Zhongxiao Dunhua MRT station, RF Hotel is an affordable business hotel with easy access to many major attractions. The lobby is actually located on the third floor of the building, which is shared with other businesses. 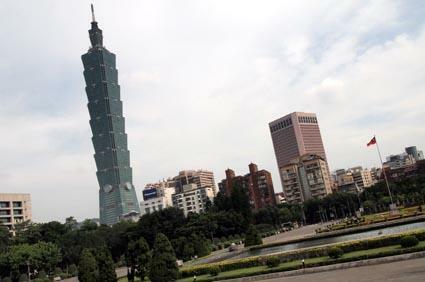 Located steps away from Taipei 101, W Taipei is one of the most luxurious high-end hotels in the city. Rooms are very large and posh, while the hotel pool offers a great view of the city. For visitors who want to visit Taipei but don't want to be right in the middle of the city, Dandy Hotel in Tianmu is a budget-oriented option. The property has great service and easy access to the MRT. Taiwanese cuisine borrows inspiration from the many regions of China, as well as Hong Kong, Japan and the western world as well. Some of the best food can be found from street vendors, offering everything from simple skewers to the freshest fruit around. 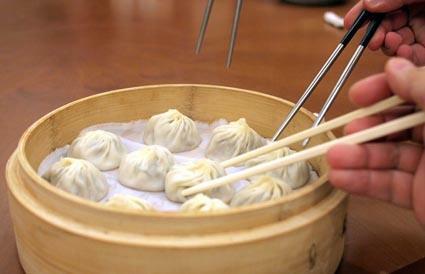 The best place to enjoy these famed soup dumplings is at Din Tai Fung. The location inside Taipei 101 is very popular, resulting in waits of an hour or more during busy times. It sounds simple enough with a beef broth, slices of beef brisket and slightly chewy egg noodles, but Taiwanese beef noodle soup cannot be missed. It can be found at a huge variety of eateries around town. One of the best shops doesn't even have an official name, being called the Tao Yuan Street (No Name) Beef Noodle by locals. Found at nearly every night market, every shopping mall, and at many dessert and drink shops around Taipei, boba (or bubble tea) usually consists of a chilled milk tea served with chewy tapioca balls. It can also come in different flavors and with a number of topping choices. Taipei has a lot to offer to just about any type of traveler. It's a city that continues to change while still firmly holding on its traditions and history. From the Dr. Sun Yet-Sen Memorial Hall to the Snake Alley night market, Taipei is a diverse and exciting city with amazing convenience stores on every corner.